List of The Best Flea And Tick Prevention for Cats - Play With Meow! To get rid of the ear mites you must visit your vet and get the ear mite medicine prescribed. The same goes for ticks and fleas, although many consider it a minor problem, you should always seek for an expert advice. There are numerous products offered on that market that promise quick and easy solutions; however, if you want to keep your pet safe you should do a thorough research and consult professionals before purchasing any of them. For this reason, I want to find out what’s the best ear mite medicine and recommend the products that are the safest, most efficient and approved by professionals. Both ticks and fleas are parasitic insects which harass animals, especially dogs and cats. Ticks and fleas are critters, they adjust to their surroundings with no problem and then enjoy a free meal –blood of our beloved pets. They lay eggs on cat's fur, but they cannot be seen with the naked eye. Most likely to spot on your cat's tail, head, neck, and abdomen. Need blood meals from a host to survive. Bury their head into a host’s skin when they bite and then gorge themselves on blood. Have a preference to attach close to the head, ears, neck, and feet, but can be found anywhere on the cat’s body. They live in tall brush or grass, where they can easily attach to outdoor cats. Tick’s size is their advantage as they are tiny enough to stay hidden while feeding. Moreover, their bites are practically painless, and the host is often not even aware of their presence which enables them to feed to their heart’s delight. You actually have to see a tick to know that it is biting. When removed, you can spot a red mark where the tick punctured the skin. You have to monitor the place of the bite for 3 to 14 days as a rash can develop at that site. If the rash occurs, it can be accompanied by a fever and headache, and that indicates that the infection is starting to progress. Proper treatment must be conducted right away as to avoid further complications and tick-borne diseases. Flea bites can usually be spotted after half an hour or so. Most often cats do not show any other signs of flea infestation than occasional scratching. Some cats, on the other hand, suffer from a flea allergy dermatitis. This condition is characterized by red, oozing sores and lose hair in areas from the bites. Flea bites are especially dangerous for kittens as they can become anemic from loss of blood. Fleas transmit other parasites to cats as well, such as tapeworm. Fleas are skilled biters and can do about 400 bites in one attack. They usually choose lower limbs near the feet and ankles; the bites stay irritated and itch for weeks. If the itching gets worse and swelling, pain and fever occur promptly visit a vet. It is useful to be able to recognize the bites, however, if you succeed in preventing them in the first place; there will be no need to differentiate tick bites from flea ones. Stay on your guard, use prevention products and you should be able to avoid ticks or fleas altogether. As we already stated, it is best to consult your vet before making any decisions about flea and tick control for your cat. Thoroughly explain your concerns and, most importantly, inform him or her about pregnant women and small children that could be exposed to the product as some treatments are toxic. Moreover, some products can only be acquired through your vet as they require a prescription. Do not combine treatments on your own as that is extremely dangerous. It is best to try the least toxic options first as that minimizes the risks to your family and your cat. There are many natural solutions that can sometimes resolve the problem. However, they are often not sufficient, and further treatment is required. Flea collars - There are many various types such as ones that contain an insecticide that kills only adult fleas and collars which contain IGR’s and kill the eggs and larvae too. Often the fleas on the lower parts of the body survive. Cats can develop a flea collar dermatitis or flea collar rash. Spot on treatments - Topical solutions that are administered to the cat’s shoulders and are very effective for killing adult fleas on cats. The active ingredients vary, and the application is commonly once a month. It is important to follow the instructions on the packet as cats are especially sensitive to chemicals. Exceeding the dosage or wrong use can result in sickness or even death. Tablets - They kill adult flea infestations that are currently on your cat and also protect your pet from ticks. Some tablets even treat flea allergy dermatitis. You can repeat treatment daily if necessary since their effect lasts for 24h. Injections - The newly developed suspensions come in an injectable form. Injections are administered subcutaneously (under the skin) in a vet office once every six months. Flea powders, shampoos, sprays, and dips - These are effective ways to kill fleas on your cat. The downside of shampoos is that many cats do not like to bathe and get very stressed during the procedure. Also, these products only kill the fleas on your cat at the time and do not prevent re-infestation. Flea combs - Flea combs only remove 10 – 50% of fleas on your cat. It is best to use a small bowl of water with some detergent and drown the fleas into the bowl. This method is most useful for removing fleas on newborn kittens as other are usually not safe to use on them. Oral suspensions - They are typically administered once a month by adding the suspension to the cat’s food. It ends up in the cat’s bloodstream, and a flea ingests the active ingredient when it bites the cat. Be sure to read the following reviews of five currently best products for flea and tick prevention. Bayer Advantage II, Flea Control Treatment comes in a package with six monthly dosages to use during spring and summer season when the fleas are mostly present. It is intended for topical use and kills fleas through contact providing multi-stage flea control and breaking their life-cycle. It should be used on cats and kittens eight weeks of age or older (weighing more than 2lbs.). 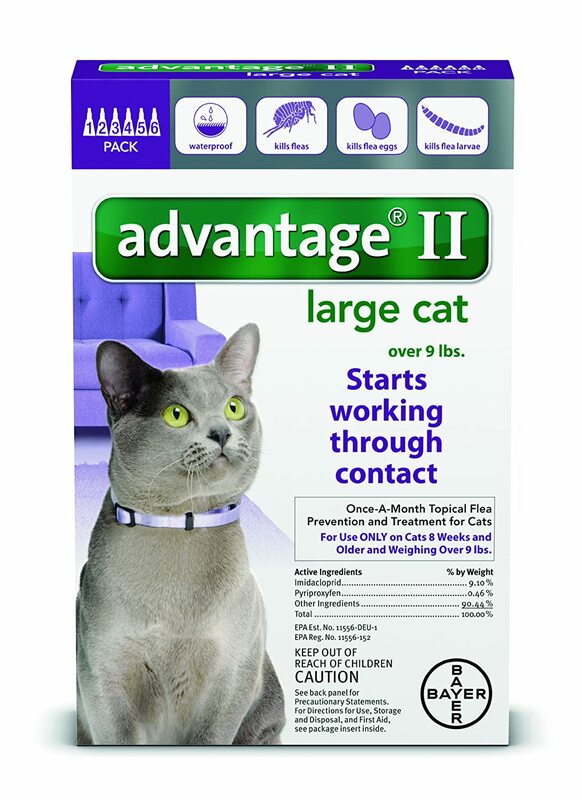 Advantage II monthly topical is veterinarian recommended, kills all the fleas within half a day from initial application and prevents further infestations for one month. It is easy to apply and waterproof. Regretfully, it does not influence ticks. A single dose is sometimes too small for a bigger cat and ends up providing less than one month of protection. On the downside, it contains a neurotoxin that besides killing the fleas, can also cause some unwanted consequences for your cat too such as hair loss at the application area, itchiness and a quite severe allergic reaction to the medicament. In all these cases or if other side-effects occur, turn to your vet for immediate assistance. 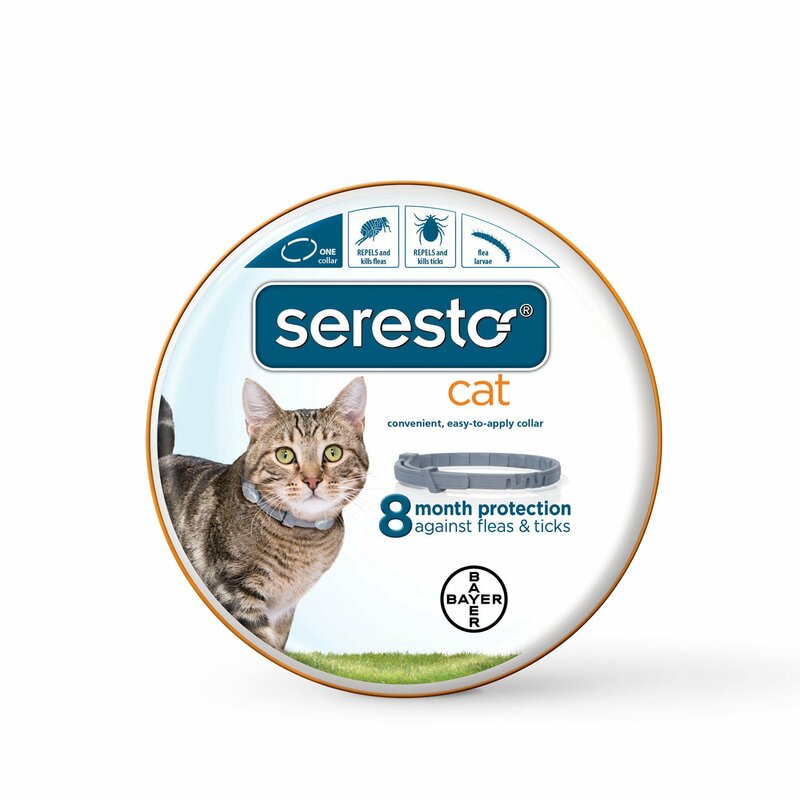 Bayer Seresto Flea and Tick Collar for Cats is a collar type product that kills and repels both flea and ticks for eight months since applying. The collar has no unpleasant smell nor does it feel greasy to touch. It effectively kills fleas in 24h and ticks in 48 hours and prevents infestation. You can use the product on cat or kitten at least ten weeks old. It is non-toxic, but allergies and side-effects do occur, and for this reason, you should monitor your cat daily for at least two weeks when using this product knowing that reactions may happen. Usually, allergic reactions such as a rash and hair loss around the collar appear, and in such cases remove the collar immediately. It seems a bit pricey, but if it actually proves to be effective for eight months, which we are yet to see, it is not. We also liked the reflection pieces that attach to the collars and the fact that the collars will break easily when they get caught on something. 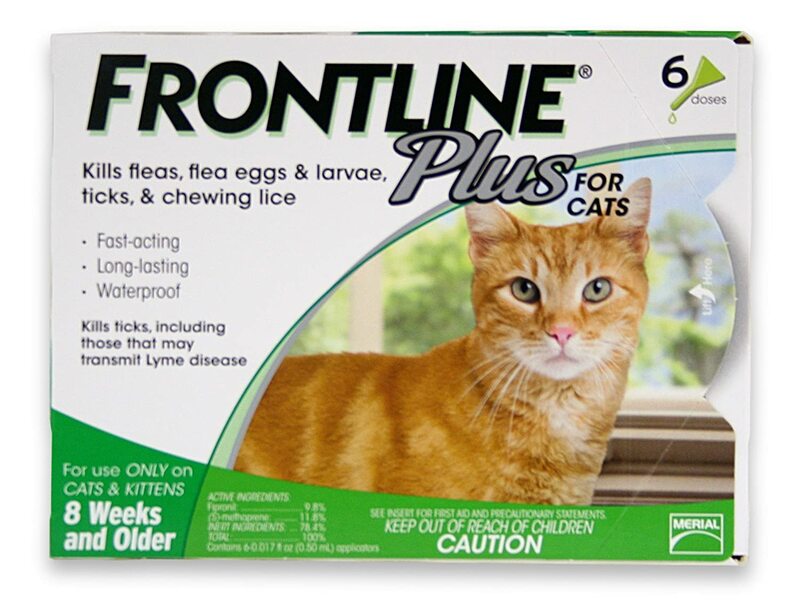 Frontline Plus Flea and Tick Control kills fleas, their eggs, lice, and ticks on cats and kittens of 8 weeks and older. It contains six doses and is applied once a month. It also comes with a limited satisfaction guarantee, is recommended by vets and numerous users, and is indeed effective. This affordable product is a "systemic" medicine which is absorbed into the cat's skin, and fleas and ticks die soon after they bite the cat. It is not a repellant, so ticks will continue to attach and you have to continue to check for their bites as the risk from tick-borne diseases remains present. The oil has a strong odor and takes quite some time to be absorbed, during which other pets and children should not be around the cat. As with every other product, cats can have allergic reactions or some irritation at the site of application. In such cases turn to your vet for advice. 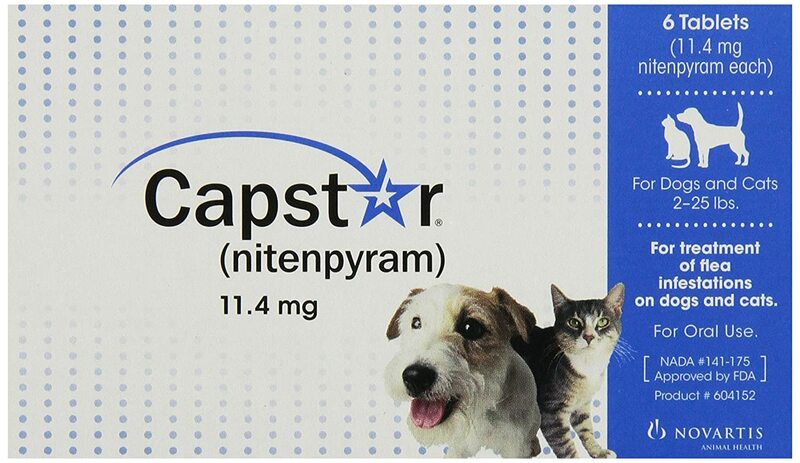 Novartis Capstar Flea Tablets can be used for both cats and small dogs, which is convenient for owners who have both. The package contains six tablets, and as far as the cats are concerned, the fleas die after six hours from giving your pet a tablet. We have noticed that in 24h almost all adult fleas have died. Although these are tablets, you do not need a prescription since side-effects are rare. For best results, it can be combined with a flea bath or a topical solution that will kill flea eggs or larvae. It is easy and mess-free to use unless, of course, your pet refuses to take pill willingly. We have hidden it in our cat’s favorite food and had no problems whatsoever. It offers short-term protection against fleas and has to be combined with some long term flea control solution, such as a collar, to prevent the infestation from reoccurring. Some cats can be sensitive to moxidectin, the active substance, and you have to monitor the pets when you give them the first dose. 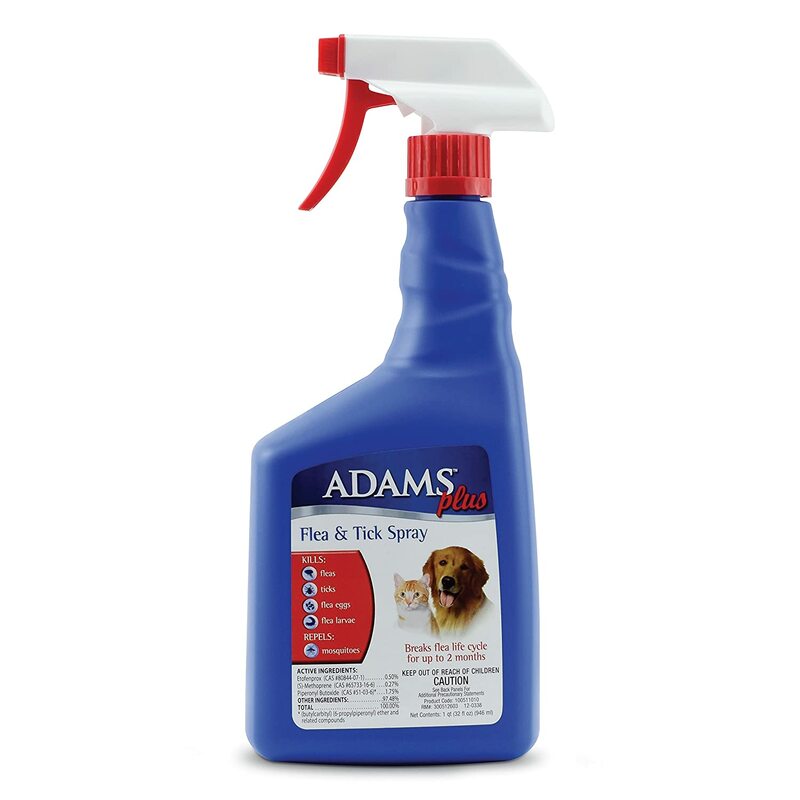 Adams Plus Flea and Tick Spray for Dogs and Cats is the quickest way to kills adult fleas, flea eggs or larvae, and ticks. The combination of two primary active substances etofenprox and S-Methoprene Insect Growth Regulator kills the fleas and ticks on contact but also provides up to two months of protection. It also protects your pets from mosquito bites. It is good for those who seek quick relief from biting fleas, and it can also be used to spray your home or other areas where your cat spends time, which will help you take the control over infestation much quicker. On the downside, there is a strong scent that might bother some people. Also, it can only be applied once a month as to avoid exceeding the allowed dosage of the active ingredient. It is not a natural product either so side effects occur- most commonly excessive salivation. Although regretfully, there is no perfect solution that would be completely pet-safe and highly effective at the same time, all the products we have reviewed are recommended by numerous vets and users. We vote for the Adams Plus Flea, and Tick Spray for Cats and Dogs, as it offers both immediate and long-term relief and is easy to apply. Whichever product you choose for your beloved pet, act quickly, as the discomfort and severe consequences of flea and tick bites are much worse than the minor risk of allergic reactions or other side-effects of these best fleas and ticks prevention products.